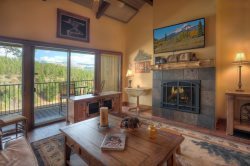 Since it’s inception in 2010, Vacation Accommodations of Durango has been providing exceptional performance to property owners and guests in regards to property vacation rental management in Southwest Colorado. As a local, owner-operated company, we take pride in representing our clients’ valuable asset (the property) by providing a high level of accountability to owners for number of nights rented and precise financial records, all whilst helping to make vacation and second-home ownership as enjoyable and carefree as possible. For guests and visitors, we offer very customized service through rapid response to inquiries, matching guests with the right property, careful handling of deposits and pre-arrival inspections to ensure that each property is in top shape before guests check in. Additionally, concierge services, such as filling the fridge with groceries for late-night arrivals, providing activity information and directions, are available to owners and guests to help make their stay comfortable and fun.